Fourme d'Ambert is an ancient French gourmet blue cheese from the Auvergne that was being made long before English Stilton, which it somewhat resembles. 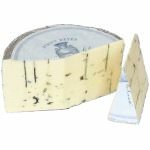 Fourme d'Ambert is a raw cow's milk gourmet cheese with light blue veining. 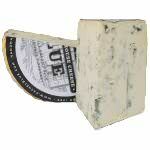 The cheese has a rough gray-brown rind and the cheese is firm, has an ivory color with greenish-blue veining. It has an interesting aroma of roasted nuts and a fruity flavor and is aged for over 60 days. 'Fourme' comes from the Latin 'forma' (form), referring to the container used to hold the curd. 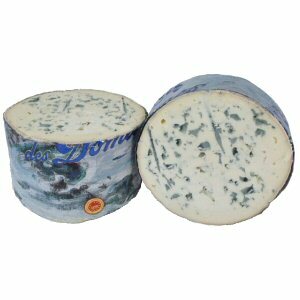 Afterwards, the name 'fourme' was retained in the mountains of Forez and Auvergne to refer to cheeses from the region. Fourme was sold primarily at the market in the village of Ambert, thus giving it its name. This is one amazing blue cheese. It is subtle enough to pair well with even a bold wine, try this friendly blue cheese with a fruit-forward California Zinfandel for a refreshing treat. We cut and wrap this cheese in pieces of 8 ounces and 1 pound. Ingredients: Unpasteurized cow's milk, salt, rennet, starters, Cacl2, Pencillium roqueforti.